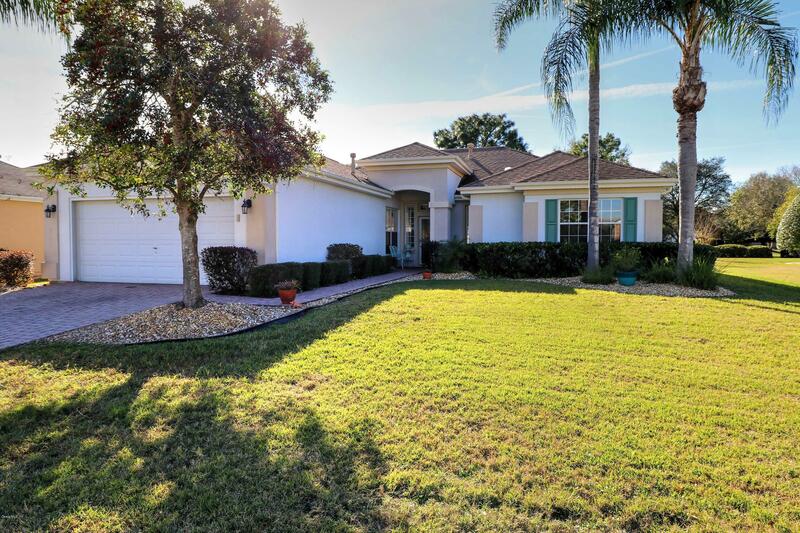 9186 SE 125th Loop, Summerfield, FL.| MLS# 549317 | Spruce Creek Realty...Retirement Communities in Florida, Resale Homes In Spruce Creek South, The Villages, Stonecrest, Del Webb. Great curb appeal. Paver drive and walkway. Stunning decorating ... ceramic tile throughout ... gas fireplace ... study/den with double door entry ... master has double door entry and bay window. Master bath has two sinks, Jacuzzi tub and shower. Eat-in kitchen, island, pantry, skylight. Designer touches abound in this concrete block and stucco Captiva. Garage is extended (21'x25'), key-less entry, attic storage, utility sink, epoxy floor. Covered paver patio with extension of an additional 8'x23'. Private lot ... near Kestral Wildlife Preserve and walking trails. Put this on the show list today!